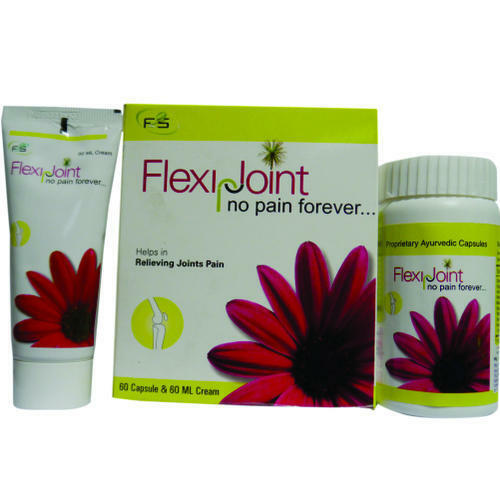 Joint Pain Kit- Flexi Joint - Flexi Joint is based on result oriented formulation called flexi joint that finds application in curing arthritis. We offer this in combination of cream capsules with formulation helping in controlling acute chronic pain in joints. With the medication controlling various herbs known in Ayurveda as effective herbs for Rheumatoid Arthritis, it helps in treating rheumatism as well as different types of arthritis as well as all types of joint pains. A pharmaceutical formulation company, Vee Excel Drugs And Pharmaceuticals Private Limited, Delhi is a renowned name in manufacturing exporting and supplying a comprehensive range of Pharmaceutical Medicines, Pharmaceutical Generic Medicines, Herbal Products, Health, Hygiene and Veterinary Products. Our range is manufactured in accordance to the guidelines of WHO-GMP and hence stands high in terms of quality. Incorporated in the year 2000 , we had expanded our operations from a blue print project to a global leadership position. Collaboration with the workforce has helped us in formulating the company’s growth strategies and in building the company as an admired level in the pharmaceutical industry. We are a fast growing company that strives to establish itself as the most efficient manufacturing organization with the view to serve the sectors of pharmacy and medicine. Our commitment towards continual improvements in terms of customer service, production costs, product quality and compliance has fetched us a reputed client base all over the world.